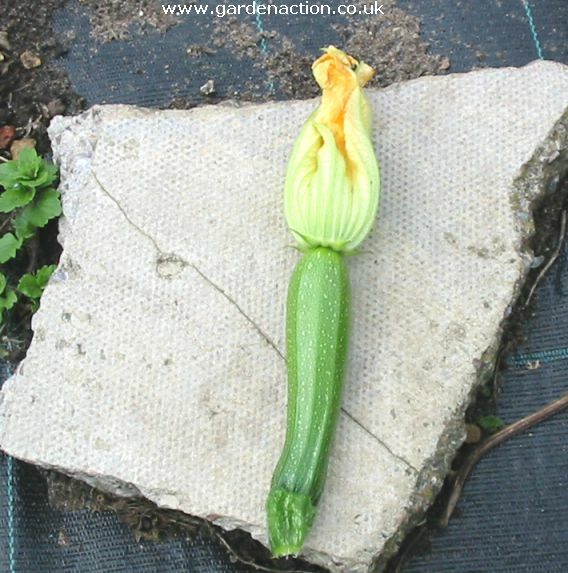 How to grow courgettes and zucchini. Although they are technically a fruit we have included this article under the vegetable section because that's how most people refer to them. Courgettes and zucchini are the same. In England they are called courgettes, in the USA and Italy they are called zucchini. Originally they were simply marrows which were harvested young. Nowadays, they will still grow into marrows but they have been specially bred to be harvested at their best when only about 10cm (4 in) long. 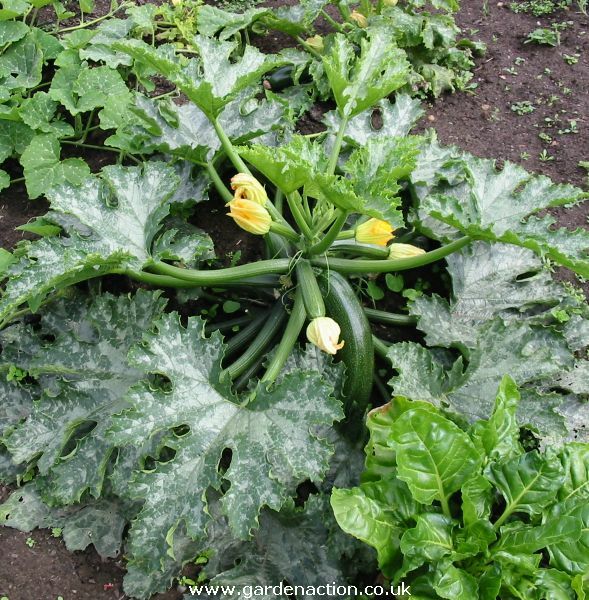 Courgettes (zucchini) grow extremely well on compost heaps as long as the heap is kept moist. This gives a good clue as to the conditions they prefer when they grown in the open ground. The soil should be well dug and well-drained but also able to be kept moist. The soil should be rich in nutrients, more so than most other vegetables. Having said that, courgettes will grow on most soils. They originated in Mexico so they thrive in an open, sunny position protected from harsh winds. Sow the seed outside without protection around the date of the last frost, early May is about right in . If you are sowing with cloche protection or starting seeds off indoors, sow about three weeks earlier. It is a good idea to place cloches in position a month earlier so that they warm up the soil. This greatly increases your chances of success when using cloches. 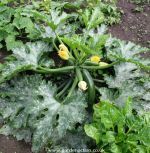 Although courgettes (zucchini) like lots of moisture at the roots, they will rot if there is too much moisture around the base of the plant. This is why the seeds are sown or small plants are planted as described below. At the time of planting / sowing, dig out the top soil to one spade's depth in an area of 45cm (1ft 6in) square. Fill about one third of the hole with well-rotted garden compost. If none is available grass cuttings will be fine. Then put back all or most of the top soil in the hole. You should end up with the soil over the hole in a slightly raised mound. Each planting / sowing position should be 1m (3ft) from the others. If sowing outside, place the two seeds in each planting position covered with 1.5cm (�in) of soil. If transplanting small plants, then they should be to the same depth as they are in the pot. To make watering easier, inset a small pot into the ground (open end upwards) near the plant or seeds. This will allow you to pour water into the pot and it will go directly to the roots. Message: I have put my courgettes in pots this year, and I have found them to produce less fruit after the initial rush. Could this mean there are not enough nutrients in the soil (I have fed them). The outer leaves have gone dry, yet there are still new leaves being produced, though the fruit tends to be small, pale and soft. What have I done wrong, and do the courgette plants have a short life, or should they still be producing?